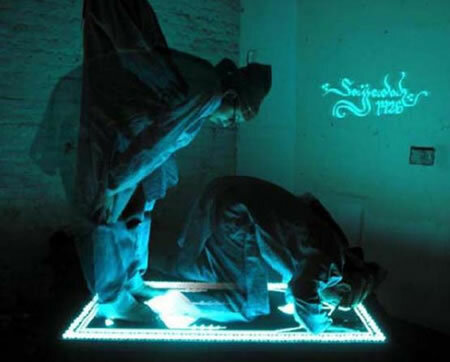 The Sajjdah 1426 LED prayer rug lights up when it is properly oriented toward Mecca. As it is turned toward Mecca, the brighter it's lights glow. The Sajjdah 1426 prayer rug contains batteries, LEDs and of course a compass to determine when the rug is properly oriented. The Sajjidah 1426 was created by Turkish designer Soner Özenç. I don't know an exact match for this idea in sf, but consider the pray-o-mat and the filament paper bible. The Prayer Antenna itself was created from a thrift-store motorcycle helmet and a large number of radio or TV antennae. Dr. Fawzi consulted with Islamic scholars before undertaking his role in the project. He says that they assured him that "such a device is not 'haram' [prohibited by Islam]. How can a traveler easily carry and study a 2,711 page book? If that book is the Talmud, the wise traveler obtains a ShasPod. Nokia N73 Special Edition offers unique Ramadan Greetings.